14 Jul What is HRV? What if we could take one simple self-administered test every day that would tell us our overall health and fitness level? And what if, based on the results of that test, we could adjust our daily routine including exercise, recovery and sleep patterns to achieve the best possible outcome for our personal well-being each day? It goes without saying this would be a medical breakthrough, following in the trend of self-diagnosis where more and more people are taking charge of their daily health rather than leaving the responsibility solely to their physician. Heart rate variability (HRV), or the variation in the intervals between heart beats, is the one biomarker that shows promise as being a broad indicator of overall health and fitness. Physicians and trainers have relied on HRV for decades because beat-to-beat heart rate micro-patterns reveal the real-time state of our autonomic nervous system which controls both our physical and emotional well-being. HRV is a measurement of the body’s internal balance (homeostasis). Now HRV is emerging as an accessible tool for us to use on our own in our daily lives. 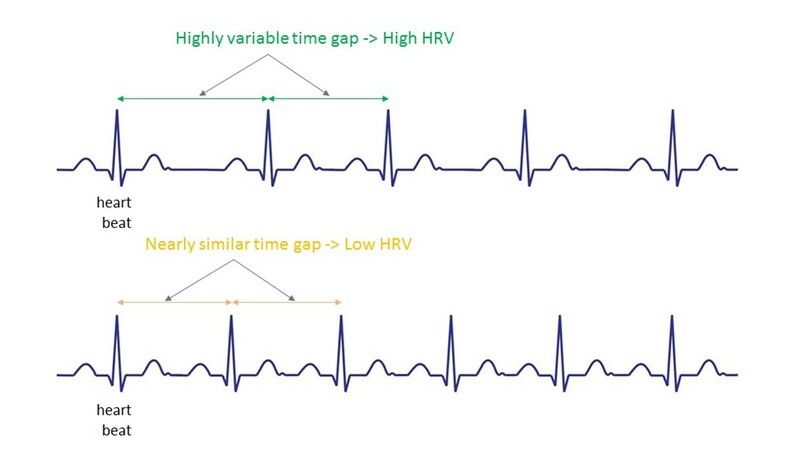 To describe HRV, and in contrast from what we know regarding traditional heart rate measurements, one must realize that the greater variability in the time gap between heart beats indicates a healthy, fit, well-rested heart. Elevating your average HRV values over time is indicative of improved cardiovascular fitness. A low HRV value (a heart beating closer to a fixed rhythm) is believed to be an indication of a poorly functioning heart – perhaps an over-trained athlete or a person who is unfit, overstressed or has developed cardiac disease risk factors. Examples of both high HRV and low HRV measurements are illustrated in Figure 1 below. By tracking HRV regularly, one can establish a baseline value and then be alerted to excessive stress or insufficient recovery when HRV readings are lower than normal. 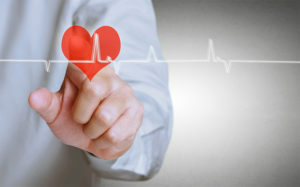 Figure 1: Heart rate variability (HRV), or the variation in the intervals between heart beats, is a key biomarker that shows promise as being a broad indicator of overall health and fitness. The time gap variability between heart beats can be readily seen on a heart signal chart as illustrated in this figure. A greater variability in the time gaps indicates a healthy, fit, well-rested heart (top chart), while a low variability is believed to be an indication of an overstressed or poorly functioning heart (bottom chart). In general, a healthy heart pumps as needed. It responds to the demands of the body, it doesn’t follow preordained intervals. A high HRV indicates dominance of the parasympathetic response, the side of the autonomic nervous system that promotes relaxation, digestion, sleep and recovery. This is also strongly associated with healthy longevity. A low HRV indicates dominance of the sympathetic response, the fight or flight side of the nervous system associated with stress, overtraining, and inflammation. Coronary heart disease, diabetes, hypertension and high cholesterol are all associated with low HRV. The most enthusiastic proponents of HRV are in the fitness world, where endurance runners, pro athletes, CrossFitters, and other high performance athletes use HRV monitoring to track their rest and recovery periods, pinpoint optimal training, and avoid overtraining. But HRV is not just for elite athletes. Anyone can measure their HRV at the same time every day and compare it to their baseline level to determine how stressed or recovered they are, regardless of activity level. If HRV is below our normal level, we are thought to be more physically stressed, so more recovery time is needed before we are ready for an intensive activity or training session. On the contrary, a high HRV measurement shows that our body is well recovered and ready to respond to greater demands placed upon it. The application of HRV is simple: on days when our HRV is at or higher than normal baseline, strenuous sessions from a training plan are ideal, and on days where our HRV is below normal, it’s best to perform easy sessions or take a complete rest. Exercise scientists have also noted that training hard on days when the body has sufficient reserves is easier to do and more likely to produce bigger performance gains than if you try to perform those sessions when tired. On the other hand, easy, low-intensity aerobic training on days when your body is recovering actually stimulates the recovery process (as well as the ability to use fats as fuel) more effectively than electing rest. HRV monitoring provides the most accurate biofeedback needed to make these types of highly personalized training decisions. ZOOM HRV is the first BLE/ANT+ compatible wearable to deliver automatic Heart Rate Variability (HRV) from the wrist at any time (while remaining still), even during sleep. Until now, measuring HRV required either sophisticated medical equipment, cumbersome chest-belts or slow and inconsistent finger-touch readings. 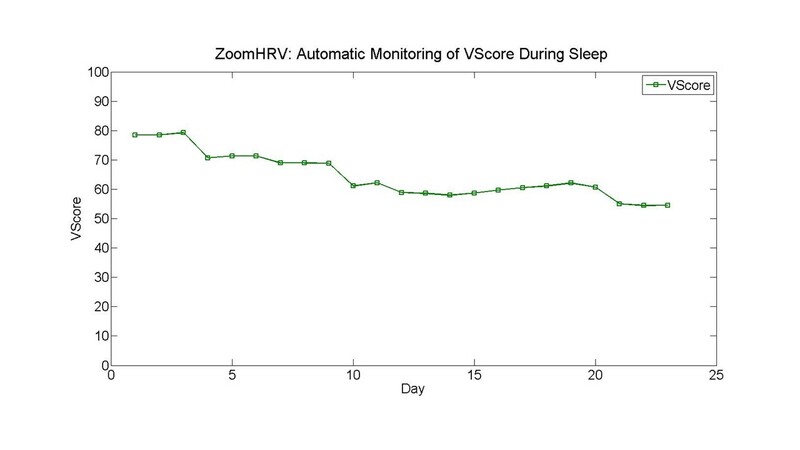 By contrast, ZOOM HRV automatically detects HRV systematically during sleep to provide an ongoing highly personal wellness assessment in a single, comprehensive fitness grade called VScore™. VScore is tracked over time to continuously monitor increases and decreases in heart rate variability related to your physical fitness, activity and sleep levels, making ZOOM HRV a uniquely powerful device in a crowded wearables market. An example of VScore taken during a period of three weeks is shown in Figure 2 below. Figure 2: Example of VScore values collected during a period of over three weeks. In this example, a VScore is shown to trend to lower values, indicating a possible increase in the level of fatigue in the body, suggesting the need for some recovery time. By contrast VScan™ is an on-demand measurement that is in the category of short-term HRV recordings, with a monitoring duration of three minutes. It strikes a perfect balance between being conveniently quick but long enough to provide a high accuracy reading. It represents the level of readiness or fitness that is unique to each individual. People who are more fit or have a higher level of readiness will achieve higher VScan values (elite athletes would attain the highest levels), while those who are less fit or not physically recovered from a training session would expect to see lower VScan values. For deeper personal insights, one can also take a VScan, for example before and after a workout, a meal, or any other activity to learn about the impact of these activities to one’s homeostasis balance first hand. It’s a tool that lets one look inside the body to see an instantaneous snapshot of the body’s readiness. For day-to-day VScan comparisons, one should try to replicate the conditions and times when taking VScans, as the VScan values can vary as rapidly as one’s homeostasis. For example, you can get in the routine of measuring your VScan once a day, when you wake up. For comparison purposes and ease of tracking, VScore and VScan are measured on a scale that generally falls between 1-100, although it’s possible to attain readings higher than 100. The relationship between VScan, the immediate HRV measurement, and VScore, the long-term HRV trend, is critically important to understanding the status of your readiness level. It is for this reason that VScore is measured while you sleep and the data collected over time is used to create an individual baseline. As such, VScore will vary more slowly, representing your HRV trend over a period of time. On-demand VScan readings are always compared to VScore to capture the variance from the user’s HRV baseline. 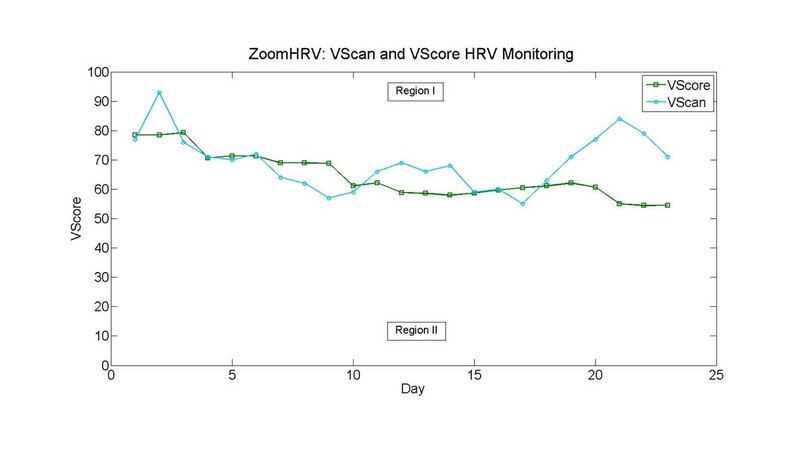 ZOOM HRV provides personal guidance for daily activity levels based on the relationship between VScan and VScore. If ZOOM HRV finds that your VScan looks healthy relative to your VScore, it will advise you to proceed with a regular workout, or to maintain or slightly increase your activity level. If it finds that your VScan doesn’t look as good, it will advise you to proceed with a light workout, or to simply rest. An example of VScans taken daily during a period of three weeks is shown in Figure 3 below, along with the corresponding VScores for the same time period. Figure 3: Example of daily VScan and VScore values collected during a period of over three weeks. The relative value of the instantaneous, on-demand HRV reading (VScan) and the long-term, automatically monitored HRV trend (VScore) provides a gauge to assess the state of the homeostasis balance of the body and is used by ZOOM HRV to provide personal guidance for daily exercise and activity levels. ZOOM HRV provides guidance depending on the relative value of VScan to VScore: proceed with a regular or increased activity level, for VScans above VScores (Region I) or to proceed with a light workout or simply rest, for VScans below VScores (Region II). ZOOM HRV also detects and measures heart rate data continuously, monitors all physical movements, auto-detects sleep, calculates calories burned based on heart rate intensity, monitors ambient light exposure and even counts laps while swimming in the pool. ZOOM HRV can be worn on multiple body locations, is fully swimproof to 50M and provides continuous biofeedback on a single charge for 5 days. ZOOM HRV is the first in a new breed of lifestyle performance wearables designed to move heart rate and physiological monitoring ahead to provide a higher level of insights with direct and immediate benefits to both athletic and active lifestyle audiences.